Rediff.com » Business » Can Idea investors make money? Can Idea investors make money? While UltraTech Cement has been the biggest value creator adding nearly Rs 99,000 crore to its market capitalisation, Grasim Industries has added around Rs 27,000 crore to its market cap, report Krishna Kant and Dev Chatterjee. 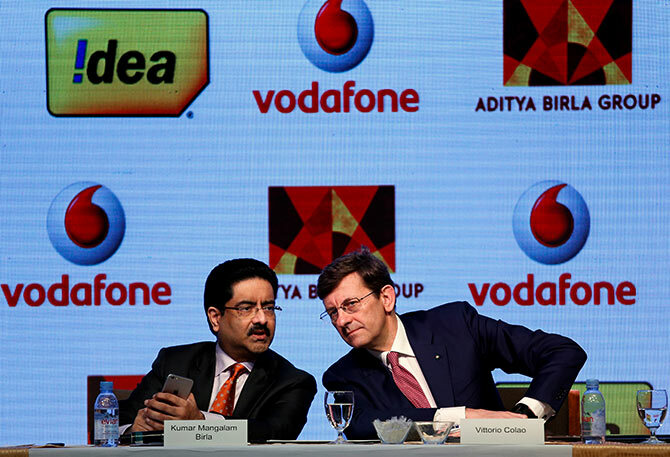 As Kumar Mangalam Birla gets ready to merge his telecom business with Vodafone in a $21 billion transaction, his previous mergers and acquisitions (M&As) show that Birla group shareholders have gained in terms of market capitalisation, along with the general buoyancy in the stock market in the past year. The Aditya Birla group companies have added around Rs 1.78 lakh crore to their total market capitalisation, nearly two-and-a-half times its cumulative spend on M&A during the last 10 years. While UltraTech remains the biggest gainer since the cement company began its M&As, Hindalco and Idea Cellular remain the laggards in creating value since their big-ticket acquisitions. Aditya Birla Group Chairman Kumar Mangalam Birla said the group's M&As over the years have added value to shareholders' wealth and as the transactions are complex, the markets take some time to grasp the schemes. "If the management has taken hundreds of hours to put a scheme like this, it would certainly take the markets some time to understand this transaction. The stock correction is a knee-jerk reaction," Birla had told Business Standard soon after the Idea-Vodafone merger announcement. Birla may be partially right. Some of the group's M&As have indeed created value for shareholders, but his biggest bet overseas -- the acquisition of Novelis by Hindalco at the peak of the commodity cycle for $6 billion has failed to cheer shareholders even after a decade. Idea's acquisition of Spice Communications' assets also failed to create value though the subsequent events in the telecom industry also added to investors' ire. The analysis shows that after being in the red as far as M&As are concerned for several years, most of the Aditya Birla group acquisitions are now making money. The incremental rise in market capitalisation now exceeds the initial cost of acquisitions for most of the group companies. For example, the group companies have cumulatively spent around Rs 68,000 crore on acquisitions -- domestic and overseas, in the past 10 years. The various group companies have now added around Rs 1.78 lakh crore to their market capitalisation, nearly two-a-and-half times their cumulative spend on M&A during the period. Among individual companies, UltraTech Cement has been the biggest value creator adding nearly Rs 99,000 crore to its market capitalisation -- nearly six times its M&A spend during the period. It is followed by its parent Grasim Industries which has added around Rs 27,000 crore to its market capitalisation since its first acquisition in April 2008. The company has so far spent Rs 1,851 crore on a clutch of acquisitions during the last decade. According to a scheme announced in October last year, Aditya Birla Nuvo would be merging with Grasim. The financial services business owned by Nuvo will be listed separately on the stock exchanges. The promoter's stake in the merged entity will rise to around 60 per cent. Corporate governance advocates have criticised the merger and have asked the institutions to vote against the proposal saying the merger would result in promoters shoring up stake in the merged entity. The group's biggest bet $6 billion worth acquisition of Novelis in 2007 by Hindalco remains a borderline case. Hindalco's incremental rise in market capitalisation is just a notch above the initial cost of acquiring the American aluminium major even after a decade resulting in negative returns in real terms. The analysis is based on the completed M&A deals by the various Aditya Birla group companies. The sample only includes those deals where the transaction value was disclosed by the group companies. In all, our sample includes 23 deals by various group companies. The acquisition cost is based on the monthly average rupee-dollar exchange rate at the time of acquisition. The group companies have been big gainers in the recent rally with the combined market cap of the top five group companies up 22 per cent in the last 12 months rising faster than 15.4 per cent year-on-year rise in the benchmark Sensex during the period. This has added nearly Rs 45,000 crore to the group companies combined market value during the period.